Ocular Melanoma (OM), two words I had never heard together before September 2009. The purpose for sharing my story is to educate people about Ocular Melanoma and offer hope to newly diagnosed patients. First, a few facts from CURE OM. Now, my story… I began noticing flashing lights in my vision in the spring of 2009. I knew this wasn’t normal, so I made an appointment to see the Eye Doctor. I was pregnant at the time with our second child. The optometrist examined my eyes but didn’t seem too concerned. When you are pregnant your hormones are all over the place and your body reacts in weird ways. The doctor advised me to continue to have my normal pregnancy check up’s and make sure my glucose tests are ok. A few weeks went by and, unfortunately, I had a miscarriage around week 12. I remember being in the Dr. office with my daughter Amelia who was 1 years old at the time, feeling so empty. The flashing lights continued. I admit I put off following up on this for a long time and blew it off as an annoyance. I certainly did not think I had something life threatening. In September that all changed…after I put Amelia down for bed one night I noticed that I was straining to see. I went into our living room and sat down. You know that feeling when your glasses are blurry, and you need to clean them to see? I always had 20/20 vision and wasn’t wearing glasses. I held my hand over my right eye and instantly knew something was very wrong; I had no center vision in my left eye. I looked up at our family photo above the fireplace and there were no faces. I called my husband Travis, who was out of town, and we scheduled an eye doctor appointment the next day. The doctor ran a few tests and still didn’t seem overly concerned. He told me he thought I had a condition caused by stress that would clear up in a few weeks. To be safe, the doctor referred me to a Retina Specialist and I was fortunate enough to be get in that afternoon. I was paranoid...how did he know this didn’t come from somewhere else in my body? He assured me that it started in my eye. In this moment I recall watching my father die of cancer and thinking of my family. He explained to me my options: Wait and see if it grows or treat it with Plaque Radiation. I would likely lose my vision in my left eye, but this would save my life. The wait and see approach was not for me. I needed to get home, talk to Travis and figure out a game plan. Walking into my house, I knew my mom would take this hard. She had come up to watch Amelia while I went to my appointment. I don’t remember exactly what I told her, but I do remember us both comforting each other. She said, “You are going to beat this. I am going to have the whole church praying for you”. There is no doubt she had everyone she knew praying for me! Travis was in the airport waiting to board his flight home when I reached him. I didn’t want to tell him over the phone, but he knew something was wrong and I had to tell him. I wish I could have been there to hug him in that moment. The only “good thing” if you will, would be that Amelia’s was so young so she didn’t really know what was going on. She may have sensed something was different but at only two years old, we worked to protect her from the reality of cancer. When Travis got home I remember feeling the safety in having my best friend with me. After spending the night researching options, it was obvious we needed to go to Wills Eye in Philadelphia and see Dr. Carol Shields. Dr. Shields is the Director of Ocular Oncology Service and a Professor of Ophthalmology at Thomas Jefferson University. When you get diagnosed with something like Ocular Melanoma or any Eye Cancer you need someone like Dr. Shields on your side. I was fortunate enough to get an appointment at Wills Eye the following Tuesday. Before I could be seen there, I had to have a body scan to confirm that the Melanoma hadn’t metastasized. Waiting for those test results was one of the most fearful things I have ever experienced. Thankfully, the results were negative. With a huge sigh of relief, we were anxious to move forward with the Plaque Radiation as quickly as possible. Travis and I would be in Philadelphia for ten days. My mother and cousin Michelle came to our house to watch Amelia for me. This was the first time I was away from Amelia for so long and missed her dearly. As we arrived at Wills Eye we quickly realized it is a well-run machine. Everyone had a specific job and I was examined at multiple stations before we met with Dr. Shields. Students in lab coats followed Dr. Shields around soaking in her wealth of knowledge. She came into my room soft spoken but firm that we made the right choice in treating this Melanoma. She reviewed her goal of treating the Melanoma with Plaque Radiation to #1 save my life #2 save my eye and #3 save my vision. I left with an appointment to move forward with Plaque Radiation surgery in two days. With a couple of free days in Philadelphia, Travis and I went to historical landmarks and museums. 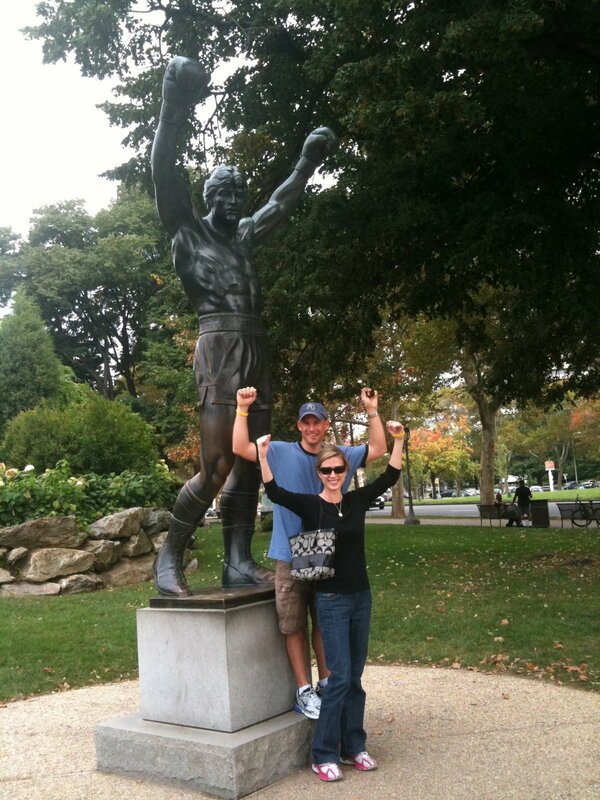 We even ran up the Philadelphia Museum of Art steps (Also known as the “Rocky Steps”) as we listened to “Gonna Fly now”. That felt fitting as I felt like an underdog getting ready to take on the fight of my life. We video recorded the run up the steps and occasionally, I pull it up as a reminder of where we have been and how far we have come. Travis and I are a good team. The day of my surgery, we met with other Ocular Melanoma patients, Terry and Patrick, who were also having plaque radiation surgery. We got to know each other, meet spouses, share our concerns, and exchanged personal information so we could stay in touch. Eventually, it was my turn to be called back for the procedure. The plaque is a thin piece of metal with radioactive seeds that would be sewn to my eye. These seeds would direct radiation to the tumor with the goal of killing the Melanoma. The plaque was left in my eye for around five days. While the plaque was in place I stayed at a place called the Water Mark Hotel. I was not to leave my room due to requirements of the United States Nuclear Regulatory Commission. Visitors are not recommended and not allowed if under 18. Travis did come visit me but had to stay at a hotel close by. I had a lot of time to sit in my room, just think, and listen to music and audio books. I could feel the piece of plaque move across my eye as I moved my eye back and forth. After five days, it was time to take it out and return home. We were back in Kansas City before we knew it. For at least a week I wore a patch on my eye and used eye drops to help fight infection. I would need to return to Wills Eye in a few weeks to confirm that the treatment had worked. After a couple of weeks my eye looked normal. Unfortunately, I had lost my vision in my eye. I have no center vision and only have minimal peripheral vision. I also had to adjust to having a depth perception problem. An example would be if I were to pour a glass of water, I would miss the glass thinking the glass was closer or further away than it actually was. I sometimes tripped when going up or down stairs and I do not see things on my left until I turned my head. I have been frustrated many times looking for things like keys and then I remember to turn my head, look down and there they are. I also learned that people with vision only in one eye are unable to see 3D. This is called Stereoblindness. I remember being at the theatre with Travis and Amelia wondering why they are reaching out at the screen when I could not see the 3D imagery. I quickly realized why. Although I have never been a fan of 3D movies, in that moment I really wanted to see it. Other than these issues I look fine and no one would know anything ever happened if I didn’t tell them. Which makes me think a lot about how we treat others and judge books by their cover. We went back to Philadelphia for follow-ups and everything went well. The tumor was dead! The follow up plan was: 1 chest x-ray a year, one MRI a year, two physicals a year and I made a few more trips out to Wills Eye over the next few years. Now I follow up with my Retina Specialist in Kansas City who initially diagnosed me. Music plays a huge role in my life and well-being. After my surgery Travis and I watched the movie Bicycle Dreams (Travis was training for an Ironman triathlon) and heard the song, ‘The Other Side.’ That song really struck a chord and resonated with us. We eventually learned the artist was Bob Schneider from Austin Texas and we became fans. Travis and I were lucky to see Bob play at his Valentines show at the Moody Theatre in Austin a few years later. It was a full circle moment. Bob performs at Knuckleheads in Kansas City from time to time and in March this year I was able to meet Bob and share my story. I am not sure I got everything across to him, but music has power and his music helped me in a dark time. I will also never forget the kindness of strangers I met while on this journey. When you have a rare disease, you rely others who have walked the same path for support and guidance. I thought about individually thanking everyone here and quickly realized that this would turn into a book. I marvel at my encounters with the people I have met. Some of them are truly unbelievable in the greatest way. I feel the best way to thank them, is to continue to offer the same pay-it-forward guidance to newly diagnosed patients. I will forever be thankful for each of them and consider them family. I want Ocular Melanoma patients to know they are not alone. The CURE OM website is a great starting point for information and support. Over time I started sharing my story at Melanoma 5K’s. I wrote a piece of my story in a book written by my dear friend Dr. Connie Robillard called “The Eyes have it”, with proceeds of the book going to CURE OM. In 2012 I was invited by Kristan Gross, Global Executive Director at Vision Impact Institute of Essilor to New Orleans to speak about my Ocular Melanoma experience at their national sales convention. In August 2017, my friend and photographer, Shea Swinford (KC Photographer for 7 Billion Ones) suggested I meet this guy named Randy Bacon. He is the founder behind the non- profit movement 7 Billion Ones. Shea said, “You will be blown away by his ability to capture people and their stories!” She introduced me, along with photographer Karen Rawlings to Randy and she was right; I am wrecked by the power of this ‘You Matter Movement!’ In that meeting with Randy, we all agreed to work together and bring 7 Billion Ones to Kansas City. I get to help others share their stories, empower and educate people across the globe. No one should go through life alone, share your story and be a part of positive change and healing for others. Your story counts! I want to end by dedicating my story to those who fought and lost their battle with Ocular Melanoma. Their lives matter and their stories live on.